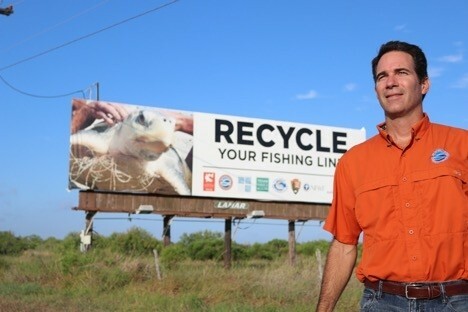 If you're driving to Port Aransas this month, you might notice a billboard with a friendly reminder to recycle your fishing line. Researchers at the Mission-Aransas National Research Reserve are leading a $72,000 campaign funded by the National Fish and Wildlife Foundation to bring awareness to local mariners about the problems of marine debris like improperly disposed monofilament fishing line. It takes roughly 600 years for monofilament fishing line to break down, providing many opportunities for wildlife to become tangled, potentially injuring or even killing the animals. Joining our Mission-Aransas Reserve in helping spread awareness of this issue are a large group of local, state, and federal organizations, including the Coastal Conservation Association-Texas, Surfrider Foundation, Texas Parks and Wildlife Department, Coastal Bend Bays & Estuaries Program, Texas Sea Grant, and the Padre Island National Seashore. Through billboards, public service announcements, signage at boat ramps, and a social media campaign the group is striving to educate anglers and boaters about the impact that marine debris, including fishing line, can have on local wildlife and its environment. Just recently, the group participated in the Coastal Conservation Association-Texas banquet for the Corpus Christi Chapter where they handed our trash bags specially designed for use on boats. In addition, staff participated in the annual blue crab trap removal event this February with the San Antonio Bay Foundation. To support this outreach effort an educational video was produced (shown below) that was viewed over 40,000 times. In addition, a public service announcement is currently being filmed for distribution.